My mom taught me good manners and proper etiquette, but I'm still rough around the edges. I try to sheathe the sharp spots with courtesy and civility, but the padding wears through at inconvenient times . . . usually when I voice one opinion too many. Incidentally, that's why I like writing. It's a safe venue to spill my roughness in a secluded setting, then grind off the sharper edges before someone gets stabbed. Yes, my column for Fire and EMS Quarterly is the polished version of my opinions. I assure you, many, many sharp edges are honed off before a draft ever reaches Laura King's desk. She then helps me hone off a few more. This blog, on the other hand, is a rougher version. I still grind and file and polish to an obsession, but it is less refined because I have the ability to publish it instantly, before it passes through the filter of more rational minds. As for my raw opinions, you don't want to see them. At the OAFC fun night last Tuesday I bumped into Fire Marshal Ted Wieclawek who asked how I was enjoying the conference. You'd think a two-bit chief who was enjoying an all-expenses-paid trip to Toronto would be nice to his benefactor. I meant to be - the first words out of my mouth were a cordial thank you for the support - but I couldn't bear to let this top fire official escape without a challenge. Was he aware that many small departments were unable to maintain themselves to provincial standards? Wouldn't it be better to provide support to these essential emergency responders, rather than bring down the hammer of compliance? Fire Marshal Wieclawek countered that small departments needed to comply with provincial regulations like everyone else. I agreed, then gave my rough-around-the-edges point of view: some are hanging by their fingernails from the edge of a figurative cliff. The provincial hammer will send them plummeting into the abyss, back to the dark ages when we had no fire protection. At this point, I remembered that Erinn (who is also a mother) had admonished me to remember that this was a fun night. I mumbled something about not wanting to detain him, and that I hoped he enjoyed the rest of the evening. FM Wieclawek expressed his desire that no one fall off any cliffs, and suggested we talk about this further sometime. Discussion is always a good idea, but I'd better bring along a personal referee to kick me in the shins when the padding starts to wear thin. Sorry Mom, I'm still a work in progress. Part of the problem is that I'm a slow thinker. It takes me a long time to process my feelings about any given topic. That's why my column is called Spontaneous Combustion. Issues brew a long time in my brain before they burst into the flame of opinion. Another part of the problem is that I'm always thinking. I can't turn it off, especially when I'm in a week long environment of fire related topics. Opinions and views that have simmered for years float to the surface, and all it takes is a puff of air in the form of a question, and an innocent bystander gets blasted by the wind driven fire of my feelings at that precise moment. Not very good etiquette for a wine and cheese party. Sorry again Mom. This weekend I'm in Fort Frances teaching volunteer firefighters, which is a good way to exorcise the Jekyll and Hyde demons that plague me. It gives me a chance to express myself to a group of people that actually came to hear me talk. Rubbing shoulders with volunteer firefighters, and the friends of volunteer firefighters, always brings out the less harsh side of my weird personality. Frank the killer whale, and Gerry, who hasn't got a nickname yet are also here to kick me in the shins if the edgy side comes too close to the surface. They are both superb instructors, and were experienced teachers when I was still cutting my instructor teeth. This morning I watched Frank wave a magic wand over a fancy device called a Smart Board, which is like an enormous iPad that is also a digital white board, and connects to a laptop as a projector screen. I remarked that Upsala still used clay tablets. A fire chief who was taking the course looked up in mock astonishment and said, "You have clay tablets?" He's from another peripheral edge of the universe department, and I suppose they still write on the walls of caves. Here's a photo I stole from Fire Chief Vince Mackenzie from Newfoundland. If you are a Firefighting in Canada fan, you may recognize the names. 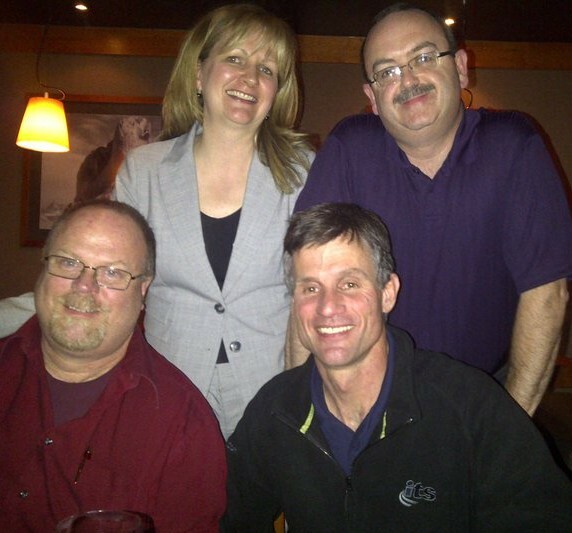 From top left, clockwise: Firefighting in Canada Editor Laura King, Fire Chief Vince Mackenzie, Tim Beebe, Retired Toronto District Chief Peter Sells. The best part of the conference was connecting with these folks, and many like them. I had other great experiences, and the resulting unedited thoughts continue to smoulder. Over the next post or two, I'll fan them into flames. For now, it's sufficient to say that I had a good time, and I hope all the people I scorched can say the same. Sorry again Mom. Well yeah, but Mom always wanted us to have the guts to speak the truth, too, you know. True. Just gotta fine tune the time and place :-).